What happens when a diverse group of 100 Edmontonians involved in good work spend the weekend together? The 2015 edition of Good 100 has now passed. We had a great time and are incredibly grateful to everyone who was a part of it. Watch the Local Good newsletter and social media to keep in touch with us about future editions. An annual two day gathering that brings together a diverse group of 100 Edmontonians involved in good work in their communities. You get to spend a weekend with others who work on local food, arts, activism, local business, social enterprise, government, advocacy, indigenous rights, social justice, charity, funding, design, non-profit, alternative media and more. Why this event? It is a chance to not only network, but foster meaningful trust and connections with good people who are up to good things and have seeds of collaborations be planted. It is a chance to offer what you know and have your world expanded by learning what you don’t know from others. This event started when we saw so many locals doing amazing things to create the good they want to see in the world; in a variety of creative, interesting, innovative and effective ways. We wanted to highlight that, to promote it, to encourage good to happen wherever and however it works best. At the same time, we kept having conversations with local do gooders that included the phrase, ‘How do you not know _______?’ We were shocked how many people, communities and groups up to important things had never connected before. And we thought, “There’s so much room for collaboration, learning and mutual support between these communities and individuals!” We wanted to host an event to help make that happen. We’ve run it three times now and are inspired by the kind of connections and conversation that are fostered. Who else is going? You can see the list of confirmed participants here. Who are we looking for? 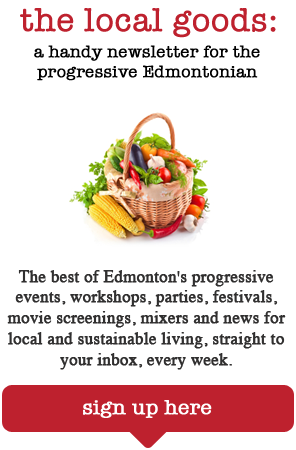 People with a specific do-gooding project they’re working on and proven track record of making Edmonton, and the world, a better place (or people new to the scene with a lot of hustle). Where can I learn more? Go to this page for the full story of the event and what to expect and also check out our FAQ page. How do I apply or nominate someone or apply to attend? You just fill out this form here. You can fill it out to nominate a colleague or to apply for yourself. Hi guys, I’d love to attend but my inlaws 50th wedding anniversary is that weekend and they’re sending us to Tofino to celebrate with them. Have fun, move and shake! Pingback: Nadine on Breakfast TV | Live. Love. Thrift.